Our veterinary nurses and the entire paraprofessional staff aid the doctors in providing the care and services at the hospital. They are committed to excellence and care for our patients as if they were their own. 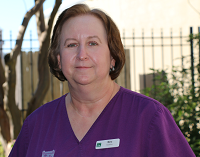 Blythe joined our practice in April, 2000 after working in emergency medicine since she earned her degree from the Veterinary Technician program at Lone Star College. 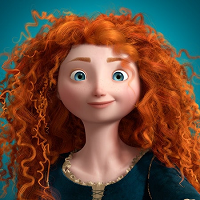 Blythe also earned a Bachelor of Science degree in Biomedical Science at Texas A&M University in 1997. 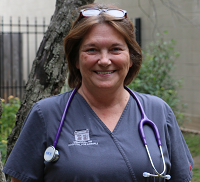 She earned her advanced certification as a Veterinary Technician Specialist in Canine and Feline Clinical Practice in 2012, and serves as treasurer of this organization. She has an interest in critical care medicine and is our lead nurse. 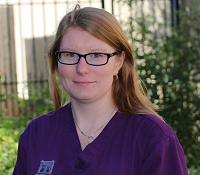 Blythe is a member of the National Association of Veterinary Technicians in America and the Veterinary Team Association of Texas and serves as treasurer of VTAT. Blythe also serves as our Practice Administrator. 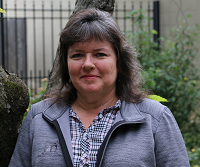 Sally joined our staff in 2017. 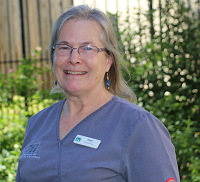 She earned her degree from the Veterinary Technology program at Lone Star College in 1995 and has worked in Houston in small animal medicine and shelter medicine before joining our team. Rickie joined our staff in 2018. Rickie was an EMT before she entered the veterinary field in 2004. She started at the SPCA and has never looked back. She became licensed in 2010 and has remained in small animal and exotics practices. She has a special interest in all things feline (large and small). In her spare time, Rickie enjoys spending time with her husband and son and snuggling with their zoo. They have six cats (Basil, he's the best, Bits, Zsa Zsa, Hedwig, Murph and our newest baby Snuggles) and their two dogs Sarge and Xena. In the future, she would like to achieve technician specialty licensing in feline medicine. Stephanie joined our staff in 2011. 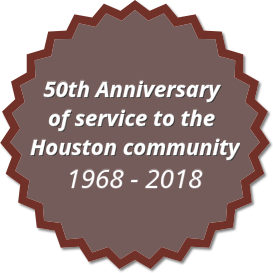 She earned her degree from the Veterinary Technician program at Lone Star College in 1999, and has worked in Houston previously before she relocated to Dallas for the last few years before joining our team. Katie joined our staff in 2015. She earned her Associates of Applied Science in Veterinary Technology from Minnesota School of Business in 2006. She worked at a small animal practice in Minneapolis, MN from 2007 through 2015 until she relocated to Houston. She has a special interest in feline and canine behavior. She enjoys hiking and running with her dog Russell. She also has three cats, Audrey, Panda Bear, and Keiko. Sarah joined our nursing staff in 2014. 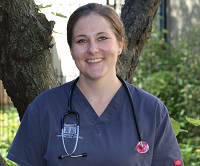 She earned her degree from the Veterinary Technician program at the Vet Tech Institute in Houston, and has worked in Houston previously in Equine medicine, research and small animal medicine and surgery before joining our team. Gloria has been a Memorial-610 team member since 2001. Her journey began in the kennel, boarding, bathing and grooming. Later, she progressed to our nursing department where she became an assistant to the doctors and LVT's. Today, Gloria is a Certified Veterinary Assistant. Her biggest challenge was feline restraint, which she has just about mastered. Her constant goal is to always give each pet the care and compassion and love each and every one of them deserve. 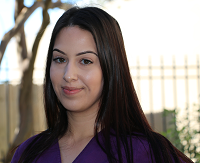 Jaime attended the Pima Medical Institute and became a Certified Veterinary Assistant I. She joined the Memorial-610 family in 2014 and is now our kennel supervisor. She continues to learn and has achieved CVA Level 2 Certification. 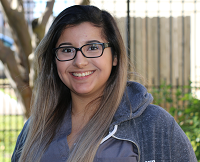 Valerie joined our team in 2014 helping with grooming and taking care of the animals in the kennels. She became an assistant shortly afterward and is currently working on her level 3 certification. She enjoys spending time with her dog Una and cats Mango and Mayo on her days off. 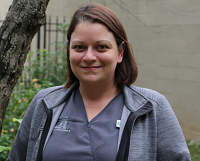 Jen joined our team in September 2016 and is a Certified Veterinary Assistant. 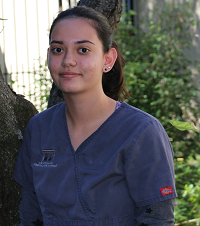 She is currently enrolled in the San Juan Veterinary Technology Distance Learning Program and she is training to become a Veterinary Technician at the practice. She is expecting to obtain her licensure by 2020. Jen has loved all animals since she was a young child and has a special interest in avian and exotics. Pearl joined our team in 2017. Pearl comes to us from a tiny town in west Texas. 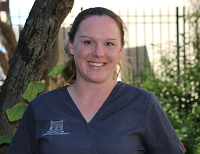 She has worked in numerous veterinary clinic settings previously and we are happy to have her with us. Mariah has been a member of the Memorial-610 Hospital for Animals staff since September of 2018. She is interested in both feline and canine behavior. Mariah has three cats - Miny, Star and Charlie, as well as two dogs - Buddy and Gwen. 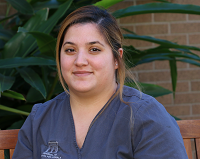 Marie is a recent graduate who earned her veterinary assistant certification. She enjoys spending time with her two dogs Loki and Tyson. She plans to continue her education and earn her veterinary technician licensure. My name is Libby, and I am the clinic cat at Memorial 610 Hospital for Animals. When I was a much younger cat with not much street sense, I needed some kind people to help me and I found my way to Memorial 610, and I’ve never looked back! The floor guy was kind enough to find me in my cage on the front porch after someone dropped me at my new crib, so he brought me indoors and set me up in the front reception lobby. I greeted my new family first thing in the morning! I lounge around the treatment area, boss the humans around, and generally observe all the daily antics (from as high a perch as possible). I like to annoy my humans by being under foot as often as possible or by laying on their keyboards. I have been known to be bit snarky at times, but I only nibble people’s fingers (I don’t ACTUALLY bite them). While I am constantly begging for food, the humans always come through with my meals (although sometimes not according to my time clock). I think it’s a pretty good gig for a reformed street cat! Chari started at Memorial 610 in 1978 at the original location off Post Oak Lane. She had retired from critical care nursing and quickly became Dr. Shell's assistant and kennel person. Her love of medicine and animals made the career change easy. Over the years her duties extended to the front office as receptionist and for the past 15 plus years she has been our inventory manager. In her off hours she enjoys time spent with her husband Will, cairn terrier Gabby, cocker SoHo and many feathered friends. Mary is the Head Receptionist at Memorial-610. Prior to joining us in 1995, Mary worked in the Banking industry. She enjoys spending time with her granddaughter. She loves baking cookies and cakes for family and friends. Dawn works part-time, both as a receptionist and also helps with Accounting. Dawn started working on the Bed & Bath desk originally, handling all of our boarders. In recent years, she moved out to the country with her husband after he retired and she works for us remotely. Monica is a receptionist, she joined the Memorial-610 team in January 2017. She is married with two beautiful daughters, Aaliyah and Lily, and two fur babies, Nala and Coco. She graduated as a Dental Assistant in 2011 and eventually found her way into the veterinary field. She hopes to continue to grow in the field and learn more about our fur friends. My name is Adel I have been a full time receptionist at Memorial-610 for almost 2 years. I was born in Portland, Oregon and raised in Mc Allen, TX. I have lived in Houston for 2 years now. I have a very handsome son named Ethan that is now 9 years old and I go to school full time. My plan is to become a registered nurse in human medicine. I have 2 years of previous experience working at an animal hospital in Weslaco, TX. Nadia is our newest receptionist. She started with us in September 2017.